Jolina dela Cruz leads the Lady Spikers' balanced attack against their rivals. 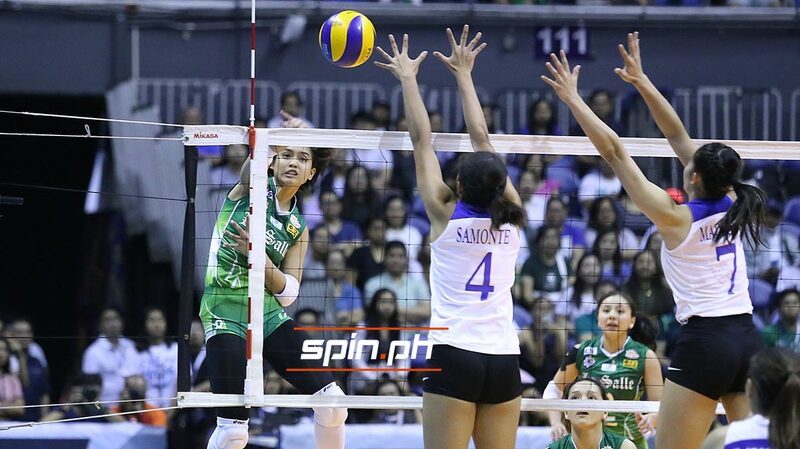 DEFENDING champion De La Salle sent Ateneo crashing back to earth with a lopsided 25-17, 25-13, 25-23 victory on Saturday to clinch a Final Four spot in the UAAP Season 81 women’s volleyball tournament before an ecstatic crowd of 15, 854 people at the Smart Araneta Coliseum. Just like their campaign-opening duel, the Lady Spikers, once again, pulled off a surprise to end the Lady Eagles’ 10-game winning streak to complete a season sweep of their rivals and book their 11th straight postseason appearance. La Salle banked on rookie Jolina Dela Cruz, skipper Des Cheng and May Luna, the same players who delivered in their first meeting, to prevail in the pivotal rivalry match for an improved 9-3 win-loss record solidifying its hold of the second place. Middle blockers Lourdes Clemente and Aduke Ogunsanya scored 10 points each and nailed the winning hits that shattered Ateneo’s comeback threat in the third set. Ateneo failed to clinch a twice-to-beat advantage as it dropped to 10-2 record. Dela Cruz showed the way for La Salle with a game-high 14 points. Luna was also instrumental with nine points, while Cheng only had four markers but had 13 digs and seven excellent receptions to help libero CJ Saga, who put up 21 digs and 14 excellent receptions, on floor defense. “Kailangan namin tong panalong ‘to para at least lumayo kami doon sa nakadikit sa amin. Dapat di na tayo matalo pilitin natin makuha yung second spot,” added De Jesus. La Salle needs to sweep its last two games against University of the East on April 24 and Far Eastern University on April 28 to secure the twice-to-beat advantage. Ateneo, the league’s best blocking team with 110 kill blocks and 2.62 average by set in its first 11 games, didn’t score a single block against La Salle’s six rejections. It was a lopsided affair in the first two sets until the Lady Eagles stormed back in the third set erasing a 16-22 deficit with a 5-0 run capped by Maddie Madayag’s back-to-back aces to cut it down to just one, 21-22, before an overreaching violation from Deanna Wong stopped the bleeding for the Lady Spikers but Ponggay Gaston still kept their team within one with a strong hit. Clemente pushed La Salle at match point, 24-22, with an off-speed but committed a service error for Ateneo to save a point before Ogunsanya nailed the match-clinching running attack to win in just one hour and 28 minutes. No Lady Eagle scored in double figures with Gaston leading the way with seven markers, while Kat Tolentino, Madayag and Bea De Leon had six markers each as Ateneo failed to clinch a twice-to-beat advantage dropping to 10-2 record. The Lady Eagles try to claim the semis incentive against Adamson after the Holy Week break on April 24.